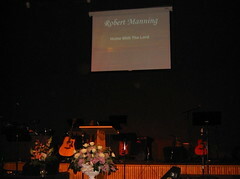 This evening was the memorial service for Bob Manning. It was a wonderful service. Over 500 people attended. There were several worship songs and Jason and Dennis sang solos. Jeff made a great video tribute. There were testimonies and John Edgecomb gave a wonderful message about what God wants to teach us through Bob's last five years. Bjorn and Marty came down from Lynden and Lindsey Widstrom came over from SPU. They all spent the night with us. It was nice to visit afterwards.